Philip V (Greek: Φίλιππος; 238–179 BC) was king (Basileus) of the ancient Kingdom of Macedonia from 221 to 179 BC. Philip's reign was principally marked by an unsuccessful struggle with the emerging power of the Roman Republic. 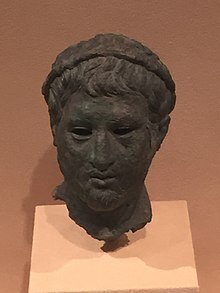 He would lead Macedon against Rome in the First and Second Macedonian Wars, losing both but allying with Rome in the Roman-Seleucid War towards the end of his reign. Philip was attractive and charismatic as a young man. A dashing and courageous warrior, he was inevitably compared to Alexander the Great and was nicknamed beloved of the Hellenes (ἐρώμενος τῶν Ἑλλήνων) because he became, as Polybius put it, "...the beloved of the Hellenes for his charitable inclination". The son of Demetrius II and Chryseis, Philip was nine years old at his father's death in 229 BC. He had an elder paternal half sister called Apame. His cousin, Antigonus Doson, administered the kingdom as regent until his death in 221 BC when Philip was seventeen years old. On his ascent to the throne, Philip quickly showed that while he was young, this did not mean that Macedon was weak. In the first year of his rule, he pushed back the Dardani and other tribes in the north of the kingdom. In the Social War (220–217 BC), the Hellenic League of Greek states was assembled at Philip V’s instigation in Corinth. He then led the Hellenic League in battles against Aetolia, Sparta and Elis. In this way he was able to increase his own authority amongst his own ministers. His leadership during the Social War made him well-known and respected both within his own kingdom and abroad. After the Peace of Naupactus in 217 BC, Philip V tried to replace Roman influence along the eastern shore of the Adriatic, forming alliances or lending patronage to certain island and coastal provinces such as Lato on Crete. He first tried to invade Illyria from the sea, but with limited success. His first expedition in 216 BC had to be aborted, while he suffered the loss of his whole fleet in a second expedition in 214 BC. A later expedition by land met with greater success when he captured Lissus in 212 BC. In 215 BC, he entered into a treaty with Hannibal, the Carthaginian general then in the middle of an invasion of Roman Italy. Their treaty defined spheres of operation and interest, but achieved little of substance or value for either side. Philip became heavily involved in assisting and protecting his allies from attacks from the Spartans, the Romans and their allies. Rome's alliance with the Aetolian League in 211 BC effectively neutralised Philip's advantage on land. The intervention of Attalus I of Pergamum on the Roman side further exposed Philip's position in Macedonia. Philip was able to take advantage of the withdrawal of Attalus from the Greek mainland in 207 BC, along with Roman inactivity and the increasing role of Philopoemen, the strategos of the Achaean League. Philip and his troops sacked Thermum, the religious and political centre of Aetolia. His troops destroyed 2,000 statues and hauled away vast sums of treasure which included some fifteen thousand shields and suits of arms the Aetolians had decorated their stoas with. These shields were the armor taken from the enemies of the Aetolians during their previous military victories and included the shields of the Gauls who had raided Greece in the 3rd century BC. Philip V took immense sums of gold and treasures and then burned down temples and public buildings of the Aetolians. Philip was able to force the Aetolians to accept his terms in 206 BC. The following year he was able to conclude the Peace of Phoenice with Rome and its allies. Following an agreement with the Seleucid king Antiochus III to capture Egyptian held territory from the boy king Ptolemy V, Philip was able to gain control of Egyptian territory in the Aegean Sea and in Anatolia. This expansion of Macedonian influence created alarm in a number of neighbouring states, including Pergamum and Rhodes. Their navies clashed with Philip’s off Chios and Lade (near Miletus) in 201 BC. At around the same time, the Romans were finally the victors over Carthage. Kingdom of Macedon on the eve of the Second Macedonian War, c. 200 BC. In 200 BC, with Carthage no longer a threat, the Romans declared war on Macedon, arguing that they were intervening to protect the freedom of the Greeks. After campaigns in Macedonia in 199 BC and Thessaly in 198 BC, Philip and his Macedonian forces were decisively defeated at the Battle of Cynoscephalae in 197 BC. The war also proved the superiority of the Roman legion over the Greek phalanx formation. The resulting peace treaty between Philip V and the Romans confined Philip to Macedonia and required him to pay 1000 talents indemnity, surrender most of his fleet and provide a number of hostages, including his younger son Demetrius. After this, Philip cooperated with the Romans and sent help to them in their fight against the Spartans under King Nabis in 195 BC. Philip also supported the Romans against Antiochus III (192–189 BC). In return for his help when Roman forces under Publius Cornelius Scipio Africanus and his brother Lucius Cornelius Scipio Asiaticus moved through Macedon and Thrace in 190 BC, the Romans forgave the remaining indemnity that he had to pay and his son Demetrius was freed. Philip then focused on consolidating power within Macedon. He reorganised the country's internal affairs and finances, mines were reopened, and a new currency was issued. However, Rome continued to be suspicious of Philip's intentions. Accusations by Macedon's neighboring states, particularly Pergamon, led to constant interference from Rome. Feeling the threat growing that Rome would invade Macedon and remove him as king, he tried to extend his influence in the Balkans by force and diplomacy. However, his efforts were undermined by the pro-Roman policy of his younger son Demetrius, who was encouraged by Rome to consider the possibility of succession ahead of his older brother, Perseus. This eventually led to a quarrel between Perseus and Demetrius which forced Philip to decide reluctantly to execute Demetrius for treason in 180 BC. This decision had a severe impact on Philip's health and he died a year later at Amphipolis. He was succeeded by his eldest son Perseus, who ruled as the last king of Macedon. ^ "Demetrius II - Livius". www.livius.org. Retrieved 5 April 2018. ^ Mackil, Emily (2013). Creating a Common Polity: Religion, Economy, and Politics in the Making of the Greek Koinon. University of California Press. p. 214. ISBN 9780520953932. When Philip V sacked Thermon in 218, Polybios tells us that his army hauled away some fifteen thousand shields that been laid up in the stoas. Although the number is surely exaggerated, Polybios’s report suggests that the Aitolians had decorated their stoas with armor taken from enemies, and Jean Bousquet is certainly correct to surmise that at least some of these were Gallic shields taken as booty in 279. Yet the dedication of shields taken from defeated enemies appears to have been a traditional privilege of the Aitolian strategos, and it would be misleading to assume that all or even most of the dedicated armor at Thermon was Gallic. ^ Vandenberg, Philipp (2007). Mysteries of the Oracles: The Last Secrets of Antiquity. Tauris Parke Paperbacks. p. 37. ISBN 9781845114022. Philip V of Macedonia, with whom the Epirotes were in league, exacted terrible revenge for the Aetolian raid the following year. He razed Thermum, the national shrine of the Aetolians and the meeting-place of the Aetolian League, to the ground. Temples and public building were burned down and more than two thousand votive statues were smashed; only statues of the gods themselves were spared. The booty in money and gold was so vast that Philip was able to rebuild his sacred city of Dion at the foot of Olympus, and the Epirotes, the sacred precinct of Dodona, bigger and better than before. ^ Polybius, Polybius (2014). Delphi Complete Works of Polybius (Illustrated). Delphi Classics. p. 495. Philip V. died at Amphipolis towards the end of B.C. 179. This article incorporates text from a publication now in the public domain: Chisholm, Hugh, ed. (1911). "Philip V., king of Macedonia" . Encyclopædia Britannica. 21 (11th ed.). Cambridge University Press.